Amish chocolate cake, Amish cooking, chocolate cake, Countryside Cooking and Chatting, food, Mennonite cooking, Whatever Happened to Dinner? I needed to test a recipe for an upcoming Amish cookbook, that is actually a remake of an earlier book, Countryside Cooking and Chatting: Traditional Recipes and Wisdom from Amish & Mennonites, compiled by Lucy Leid, Herald Press, 2004. Next year it is being renamed and republished as Gather Round the Amish Table. The new cookbook will be illustrated with appetizing full color photos. The book has many lovely, delicious and authentic Amish and Mennonite recipes. In fact they are so authentic they’re a little loose on directions and specifics. So the project editor had several questions she needed answered about this particular recipe which didn’t have enough detail. The Amish women, readers of a weekly “plain” newspaper, Die Botschaft, submitted recipes but last names were not published, which we understand to be out of modesty and community values. So there was/is no way to contact the original recipe submitters. So the questions were: How long to bake it? What size of pan to use? The way it was written sounded like it was for one pan, but how big, since the recipe calls for 6 cups of flour and 4 cups of sugar, enough for two normal cakes! Two key differences in this recipe from most cake recipes is that it calls for no eggs, and asks for lard. Of course other shortening can be substituted, and sometimes you have to hunt or ask around where/whether old fashioned lard can be found in your area. But I knew just where to go because of having used lard in my Amish noodle experiments last year. It is nice to have a fall-back homemade cake recipe that doesn’t call for eggs since we all run out from time to time. Cooks in older times or homesteaders today, who depend on their own flock for all their eggs, know why there was a definite need for recipes without eggs: chickens, normally in the fall but it can vary as length of day shortens, go through a hormonal change resulting in a molting period and losing their feathers where they get a break from laying eggs. Here’s a pretty good beginner’s description. So there may be 6-8 weeks of no eggs. Hence, in times or areas where you can’t just run to the grocery store, there was a need for recipes without eggs. Turns out, it had the same basic ingredients as one used in my own cookbook, Whatever Happened to Dinner: Sheri’s cake, which I shared here, which also doesn’t call for eggs. Why would anyone make this much cake at a time? Amish families often have 8 -12 or more children. Many families longer ago had this many (and more children). A book I’m reading which I’ll cover in an upcoming post speaks of a family with 18 children, long before the Duggar family. You get the idea. But, if you have just 2-4 kids and need a monster cake for the soccer team, a potluck at church, signing up to bring a cake for a funeral dinner, soup kitchen, or other large feeding program, this is a great recipe. I had enough to test with two different groups (knowing my empty nest household would take forever to finish it and suffer from too many calories). 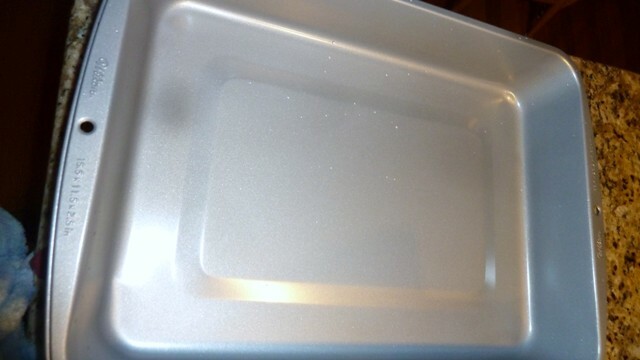 Or, if you bake it in two 9 x 13 inch pans, eat one and freeze one—it freezes well. In a big bowl, mix sugar, coca, and lard. Add hot water and milk. Add rest of ingredients, mixing well. Pour in two 9 x 13 pans or one 11 x 15 pan. Bake at 350 degrees for 30 minutes if using the 9 x 13 pans, (or until a toothpick comes out clean), or 45 minutes for a 11 x 15 inch pan. Frost with your favorite frosting. Bonus topping, wherein I turned a mistake into a success! 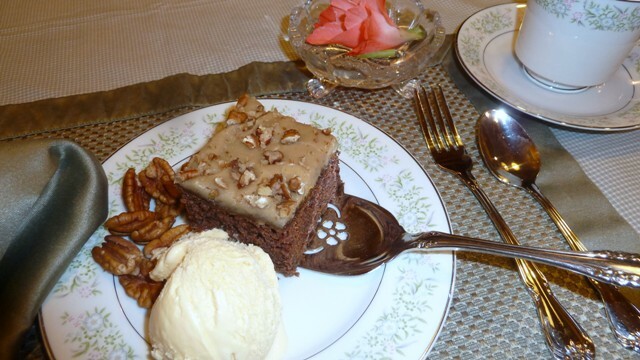 I topped this with Carmen Wyse and Wayne Gehman’s Penuche frosting from my book, Whatever Happened to Dinner, recipe here (and photos showing normal process!) I was in a hurry and make a mistake: instead of adding the milk to the brown sugar and butter and bringing it to a second boil, I put in the powdered sugar and milk after taking it off the heat. Oops, a mistake I couldn’t rectify except by beating the frosting smooth. It ended up like a glaze with a few powdered sugar lumps I couldn’t beat out, which easily covered the whole 11 x 14 inch cake; I covered up the slightly lumpy glaze with chopped pecans. The normal penuche frosting is very thick and paste-like and hard to spread (although delicious) and would never have covered the whole 11 x 15 inch size. Just sayin’ if you want to benefit from my mistake. 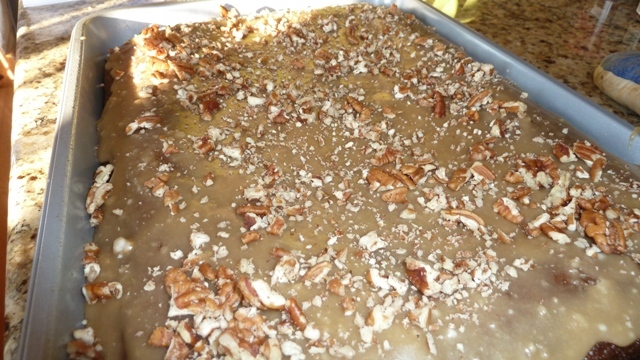 The pecany glaze made a great, thinner topping, with candy-like sweetness on the chocolate. I’m getting hungry again. If you enjoy cooking and following new recipes, and would like to volunteer for occasional recipe testing for cookbooks we are publishing at Herald Press, let me know! We’ll put you on a list. Have you had a cooking mistake that you turned out to like? I do not consider myself a queen of cooking at all, although my family enjoys and appreciates my efforts. But I have found cooking dishes or new recipes for the blog has revived my interest in cooking, now that the kids are gone. For awhile, I was like, why bother much for two of us. But I’m having fun and even though not sure where it is going (is my blog too multi-focused?? ), I’m learning much. So far hub hasn’t complained. 🙂 I love the Stevenson quote, you are queen of fine literature! Funny the directions say one T baking soda and three t baking powder…when that is the same amount.